Just bought my first GoPro and it’s the Hero 3+. I can’t wait to test it out next weekend in the water. My question is what mounts do you think are best? I saw the mask with the built in mask, but I noticed from watching youtube videos, that all the bubbles run past the mask and it disturbs the field of view as well as is very loud. Anyone running a different kind of setup? My son just bought a go pro for his motor cycle it came with a mount that stuck on the side of his helmet. Have not had time to search on the internet for alternative mounts for diving. If I cannot find a good alternitive I was thinking of buying another mount and fasten it on the side of the goodmen handle for my dive light that way it would allway be pointed where I aim my light. I took a Princeton Tec Mini Wav LED and cut a transparent plastic lid as a diffuser adding it between the lens and emitter assembly. I then used the self stick mount to add the camera on top of the light. This worked extremely well as a pistol grip camera assembly. It could be done to most 4 or 8 cell pistol grip lights. Use the light on high even during daylight shooting to photograph into a crevasses. Moving the camera slowly will produce the best results. Myself and a buddy are actually working on some mounting options for diving, right now working on a way to mount on a tank to look forward or backwards. I will post results on that. 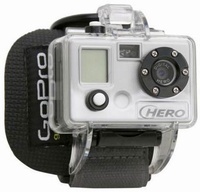 I have used the GoPro head mount and find it works pretty well, just hang onto it going in. I always use some form of a lanyard to secure my go pro. I have heard of a few people now have the mount come off, unstuck, whatever and the camera is gone. That octo-mask looks pretty cool, but there are several tutorials on you tube of how to make your own mask mount using the tripod mount, bolt, and a little silicone. Just search gopro mask mount. I would be interested though in hearing if that octo-mask is a decent mask and the mount is solid. Something to keep in mind. I built a "Fig Rig" out of PVC pipe, it really help to stabilize the camera. Google Fig Rig and you will see all sorts of homemade mounts. I found that GoPro (at least mine GoPro2) "add the distance), so what I remember from my dive being 2-3meters (6-9ft) away on the movie it looks almost doubled. That’s why mounting of my choice is telescopic pole. Besides imagine getting a nice close up of moray eel with mask mount.... Pole mount is also good to "look up" any reef crevices. GoPro works quite amazingly in low light, so this setup is good for all the lobsters or hiding octos as well.